WARNING!!! This information is provided only for your entertainment. It is dangerous and in many places illegal to use a large propane tank in this manner. DO NOT TRY THIS AT HOME. 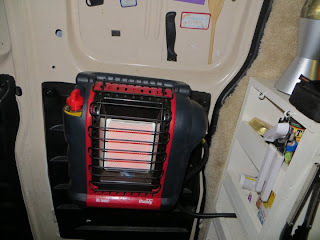 The Mr. Heater line of propane heaters is one of the most popular ways for vandwellers to keep warm during the winter. I have two of these wonderful machines – one in use, and one in storage. They do a great job at all temperatures and allow me to boondock camp without the need for electricity. There is only one problem – the little heater lasts only about six hours on a one pound, spin-on can of propane. The small canisters are expensive and always seem to run out right in the middle of a good night’s sleep. To show the readers how I added a larger capacity tank, it is necessary to detail the layout of my van. The left side contains mainly the bed. The right side is primarily for the kitchen counter. Immediately to the front of the counter you will find the cargo doors. The Mr. Heater Buddy is mounted to the rear-most swing out cargo door on the passenger’s side. 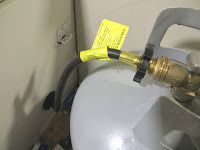 I decided to rig up a way to use a 20# propane tank for the winter months. It is sitting between the bed and the kitchenette. 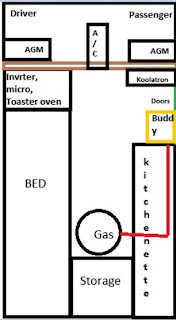 The hose is routed through the bottom of the kitchen counter and out through the far side (near the heater). To accomplish this, I purchased a Mr. Heater brand 10 foot hose, model F273704. The less expensive hoses require the use of an inline fuel filter. This is because the cheaper style hoses can ooze a little oil as line pressures build up. That can cause problems at the heater. The F273704 is a “non-plasticizer” type material, doesn’t secret the oils, and thus no filter is needed. For safety reasons, it is not a good idea to run a hose inside an enclosed cabinet. I was particularly concerned that at the entry and exit points the rubber might get chaffed and the hose leak. 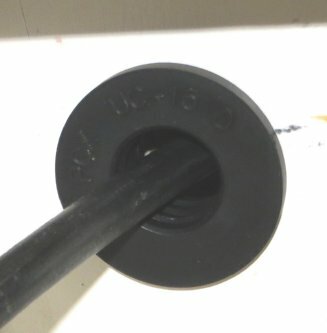 To deal with the potential for scraping, I drilled 1.5″ holes (large enough for the connectors to pass through) using a hole saw attached to a drill. At the local Ace Hardware, I located these very large rubber things… I guess I will call them grommets but they are more like bushings. They snap into place and protect the hose nicely. The amount of isolation from the wood edge to the center hole is around 3/8″ of an inch. It worked out great! The best part is that by opening and closing the van door, the hose slides in and out a bit so no strain exists. Then when the weather warms up in March or April, I can just unhook the hose and store it inside the kitchen cabinet. The propane tank still needs to be secured before the van is put in motion. I’ll likely add some screw eyes and tarp straps to keep the tank from moving. At the end of each use I turn off the propane valve by the bed and let the Mr. Heater run for a few seconds until it burns off the last of the vapor. Then I also turn off the heater to make help ensure no gas leakage. BUT ONCE AGAIN…. DON’T TRY THIS APPROACH. It could result in a fire or explosion. For that reason, this idea was provided only for your entertainment. At the moment, it’s 77.5 degrees in the van… 19 degrees outside. I’ll take the risk. Just use extreme care any time you are working with propane. Awesome review . I am going to use the bigger tank when I get a sprinter. Great post! Looks like this was a good change for you and will keep you pretty warm. Your new handle is now Brad Dangerfield. I have sort of the same thing, also only for entertainment purposes. I am however surprised that you need to have it so hot inside the van. At 19° exterior and 77 on the interior, don’t you get a hell of a lot of condensation inside the van ? By experimenting around I feel I’m able to sleep at about 50° inside trailer temperature. I have found out that I get a better quality sleep with the lower temperature. I remember my German grandma sleeping with the windows wide open on the sub freezing nights. On the next model I plan to put a electric floor tile heating mat under some tiles and laid that underneath the queen size bed, as I don’t really like the smell of the propane – it makes me sick & can’t really be good for you. I will try to use all electric to provide the minimum amount of heat needed. 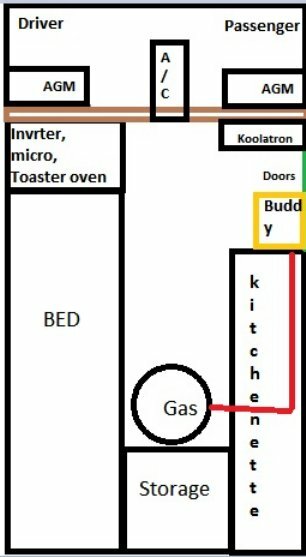 I am estimating that if I heat the mattress from the bottom it will take one third the amount of electric then heating the whole then interior. Hi Over the Top… I do get a fair amount of condensation inside the van but keep the roof vent open during the day – often running the fan on low speed. Also, it’s quite dry right now which helps. I’ve got some joint issues going on right now and at temps below about 65 I am in pain while sleeping… I find that at the mid 70s, the pain goes away. Also, if it is too cold, the air from the CPAP machine (for sleep apnea) burns the nose. If running on 12V, I cannot run the heater for the machine. The hot room air helps. I’m a little claustrophobic and prefer to sleep with minimal apparel. I like the mid 60s but it’s too hard on the breathing and joint pain. Lots of weight you could ditch the CPAP machine sooner or latter ?